Between long meetings, tight deadlines, and unnecessary office drama, workplace stress can quickly become overwhelming. As a result, our mental clarity declines and our productivity goes down. 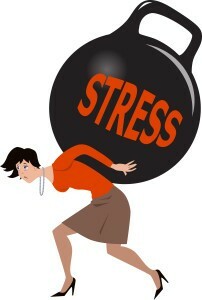 Many of us then carry this stress back home, where we take it out on our families, partners, and healthy sleep cycles. Thankfully, there are many things we can do when our blood starts to boil and our heart rates begin to rise. In fact, you might be surprised how a few tiny tweaks have the power to transform your entire day. The human body was not built to be sedentary for long periods of time, and incorporating some movement is especially important when you feel like you’re about to break. Stress atrophies the brain, but exercise promotes the production of neurohormones that fight that harmful effect. When tensions are running high, go for a 10-minute walk. If you can, take a stroll through a park or another green area, which can put your body into a state of meditation called “involuntary attention.” According to a study out of Dartmouth College, frequent walking can boost BDNF, a protein responsible for mental acuity and learning (ie: you’ll be more effective once you return). Turns out having friends at work isn’t a distraction — it’s actually beneficial to your health! In a study published in Health Psychology in 2011, researchers found that those who didn’t have a good support system at work were 2-1/2 times more likely to die over a 20-year period. Positive social interactions are shown to help increase happiness, self-esteem, and relaxation, while lowering levels of cortisol that contribute to all manner of issues like heart disease and obesity. If you feel your stress starting to rise, ask a friendly coworker to grab coffee or tea. Good company and time away from the office will help you clear your mind. Just focus on keeping the conversation positive and not about workplace stress. Start by gently rubbing and pulling down on your earlobes with your thumb and index finger. Focus on your breath as you do this five or six times. Next, move up the outer edges of the ear, squeezing as you make your way to the top. Finally, take your index and middle fingers and massage the bony part of your skull right behind the ears. Ta-da! Peace and relaxation.